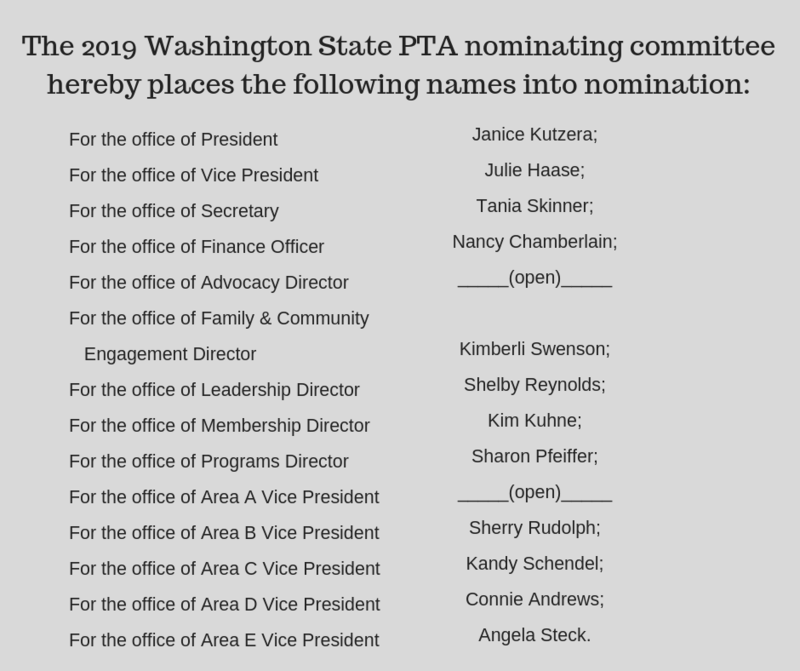 The nominating committee has confirmed that all nominees have been a member of a PTA for at least 15 days prior to the election, and meet other requirements as stated in the WSPTA Uniform Bylaws. The 15 day window for self declaring is now open. All information is due no later than 11:59pm February 8, 2019. Per WSPTA Policy, section 7.4.1, this is the official call for self-declared candidates. Qualified persons may self-declare candidacy by submitting a Declaration of Good Faith form indicating their intent to run. He/she is a current PTA member. He/she meets the qualifications for the office. He/she shall abide by the campaign/election policies and guidelines. a statement, not to exceed 150 words, to be included in the convention program and on the campaign board. a statement, not to exceed 500 words, to be posted on the WSPTA website. a one-page (8 1/2″ x 11″) résumé, to be posted on the candidate’s page on the WSPTA website. To be considered as qualified for a position review the WSPTA Uniform Bylaws, Article 7 Section 3F for each specific position’s eligibility requirements. Job descriptions for each position may be found here. Upon receipt of the Declaration of Good Faith form the WSPTA office shall send Elections Oversight Committee (EOC) information, campaign regulations and any other requirements to all candidates. You may have noticed two blank positions on the slate – Advocacy Director and Area A Vice President. The nominating committee did their best to find a candidate to place on the slate for these positions but for a variety of reasons they were unable to identify a qualified candidate. We need you to step up and self declare for one of these positions. See the above article for information on self-declaring. 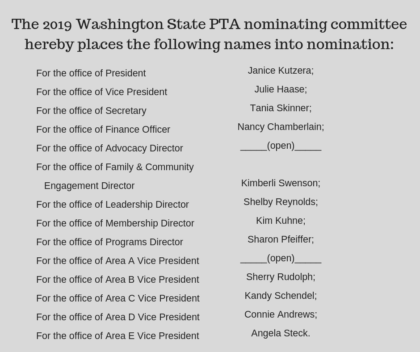 The officer elections will take place during the WSPTA annual meeting at the convention on April 26-28, 2019 at the SeaTac Hilton Convention Center. To help delegates make an informed decision about their vote, candidate information will be located on the website prior to the convention. Campaign boards will be provided by WSPTA and located in public areas of the convention center during the convention. And, opportunities for delegates to hear from each candidate will be provided through some combination of speeches, candidate forum, or networking areas. The Elections Oversight Committee (EOC) oversees the election process. The committee shall review all materials for compliance with WSPTA Policy. All concerns raised during the election period shall be directed to the EOC chair.